To learn more about our school community and the curriculum pertinent to your child, we welcome families to visit our school. During this visit, please enjoy a tour of our facility. Registration is complete once families have met with the Principal and completed all necessary registration forms including health records. 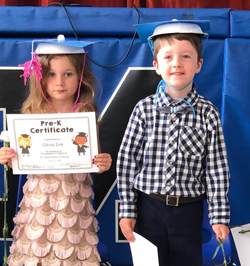 In the school’s welcome letter families will be asked to send in a commitment fee of $100 per child to secure the child’s place in his or her class. The commitment fee will be deducted from the total tuition cost and the balance will then be based on the payment plan chosen by the family. St. Matthew School utilizes the SMART Tuition program to assist in the collection of tuition for all grades. Ms. Kate Ricci, Administrative Assistant. *All forms will open in a new browser window.